Upon contact with the punctal ring, the Parasol® Punctal Occluder will automatically collapse – reducing its size more then 50% – for simpler insertion with minimal trauma. You may even find that the dilation of the punctum is unnecessary. Once inserted, it “opens” like a parasol, to conform to the size of the canaliculus. 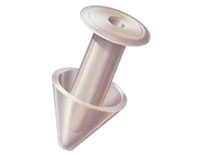 The result is a precise, almost customized fit that resists accidental removal. You’ll also note that the virtually invisible dome of the Parasol® Occluder provides a very efficient lacrimal barrier. With only three sizes, you can be assured of having the “right one” always available … and possibly reduce inventory costs at the same time! If it ever needs to be removed, just apply a constant gentle, lifting force beneath the dome. The soft-as-tissue parasol® will reverse and slide out smoothly.